Microscope Metallograph for research, development, quality assurance, measurements and laboratory analysis. Inverted Stage Microscope is on an Optical bench with superior frame stability again vibrations. Large Rotation Stage with Coaxial XYcontrols. Coaxial Coarse and fine focus controls. Universal Illuminator for bright field and dark field, 12V 100 W halogen and 200W Xenon Light Source. Viewing Heads Binocular head, 45 inclination. Two pairs eyepieces Plan compensated PK 6,3x , PK 12,5x, PK 4 x Photo,. PK 5x Photo, PK 6.3xPK 8x, PK 12,5x designed to accept 19 mm. Diameter reticules for measuring purposes. Plan 4/ 0,08 250/-, Epi 8/ 0,15 250/0, Epi 16/ 0,25 250/0, Epi 40/ 0,55 250/0, Plan Epi 80/0,90 250/0,.Plan oil 125/ 1,25 250/0, two objectives for standard magnificatons 100x and 400x. 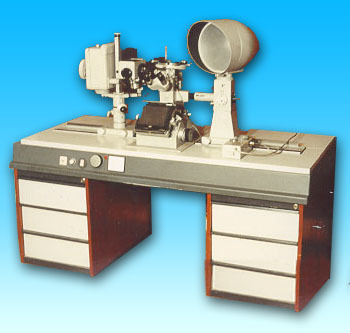 Optical bench with built-in base transformer and electrical devise for variable intensity control to operate 100W Halogen and 200W Xenon Light Source. Glass plate for measuring 1/0,01mm., Five metallic plate for Rotation Stage of the Microscope, Attachment for low magnification observation of uneven surfaces, broken parts. Special holder for putting small specimens on the stage of the microscope.3 stage clips. Electrical control device with shutter for photomicrography system. Adjustable tube with eyepiece 6x for fine focusing on the photomicrography and projection screens. Various colored light filters. Projection screen (Didaktoscop) with diameter 220mm. and possibility for increasing image from 50 : 1 to 1500 : 1. Reichert Microhardness tester with measuring objective and indenter with diamond prism for testing microhardness on the stage of the microscope, using the Vickers hardness scale. The system is in an excellent condition. Reichert metallograph Me F2, for a long time is a classic for metallography work. The sideport can accept digital camera. Large projection screen is used for discussion/teaching. Price: $4,800 lowest, in which are included crating, insurance and shipping by air to some international airports in Europe and North America.